This truck has NEVER seen the snow or salt, just moved here from the south. 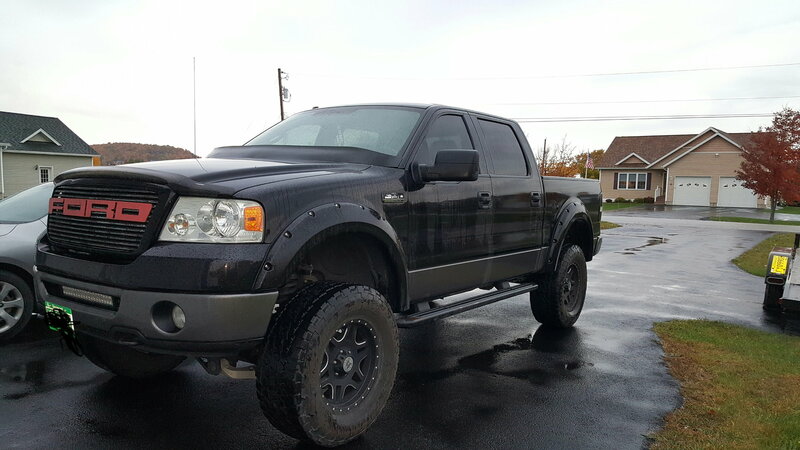 2008 Ford F150 FX4, 4X4, with 5.4L and auto trans. Has 6" Rough country lift with 35x12.5x18 tires and black aftermarket rims. Has fender flares as well as a wiper Cowell and a gryphon programmer. Has 2 10" subs under the rear seat with the stock 6 disc radio. Has leather seats. Has some minor dings on tailgate and side of the box, see pics. Has been a great truck, just need something more family friendly. Just under 70k miles, always had maintenance done on time and has never been in a accident, I am the original owner. Asking $17,000, located in Vermont, we just moved here from the southwest. Decided not to sell, can a administration delete this post? I guess I should put the new price up when I say it's back up for sale, asking $16,000.